I've always been fascinated by the window language gives us on plant origins. In English it isn't hard to see which of oak, ash, pine, and cryptomeria is the foreigner. Start learning a foreign language, and you soon realise that the (relatively) modern travellers of the world, tomato, coffee, bananas, and so on, have carried their names with them, whereas for plants which are indigenous, or whose arrival is lost in history, you have to learn a "real" local word. In Japanese, for example, we have tomato, koohii, and banana, but the indigenous cryptomeria is simply sugi, or the local ash (Fraxinus japonicus) is tamo. Then (assuming you start gardening later than you start learning languages! ), you spot that many of the fancy names of plants are simply people's names, disguised as mock-Latin. 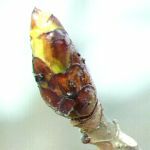 Stephen Spongberg, a horticultural taxonomist at the Arnold Arboretum in Boston Massachusetts, has written a lavishly illustrated account of how many of these plants got where there are now and who gave them their names. Along the way he throws light on the complicated history of exchanges between Europe, Japan, and North America. Chapter 1 sets the scene: in the first half of the seventeenth century, the most prominent of the instigators of the art of plant collection were the Tradescants, father and son, in London. They were collecting plants from all over Europe and the new American colonies, and also helping to spread exotic European trees such as the horse chestnut to America. This was a century before Linnaeus introduced the modern system of nomenclature, which may be one reason I don't remember seeing "Tradescant" in a plant name. In Chapter 2 a new round of exchange between Europe and North America starts, following the War of Independence. This is where the names behind the plants begin to appear: Sir Joseph Banks, or Dr. John Fothergill, Englishmen whose names are more familiar now as Banksia and Fothergilla. This view of the Dutch settlement at Deshima (Dejima) appears on page 82. I've reproduced the title (written leftwards in the top right corner), and marked the area of the botanical garden in red. Then Chapter 3 begins the story of interaction with Asia, and Japan in particular. 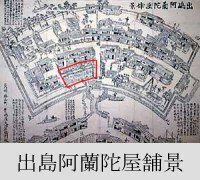 The three great names of Europeans stationed in Nagasaki - Kaempfer, Thunberg, and Siebold - are probably much better known in Japan, because in addition to absorbing knowledge of the local flora, these were important historical figures in Japan's period of limited contact with the western world. Deshima was a fan-shaped artificial island in Nagasaki bay, originally built for the Portuguese missionary-traders in 1634. Soon, though, only the Dutch were allowed a presence. Actually, Kaempfer and Siebold were German, and Thunberg Swedish: Kaempfer seems to have slid under the bar, but the latter two both had to pretend. Thunberg spent three years practising his Dutch at the Cape of Good Hope on the way to Japan, and Siebold's accent was explained away as that of a "mountainous region" of Holland. Kaempfer lived on Deshima for only two years (1690-1692), but was responsible for creating the little botanical garden, and for providing the first comprehensive introduction to Japan's flora in a western language. One particular example: he seems to have been the first to describe the ginkgo "living fossil", which was soon to become widely planted in Europe. The title of Chapter 3 is actually "On the Rim of the North Pacific". At the same time as Siebold was finding plants (oh, and love too - shades of Madame Butterfly) in Nagasaki, a Scot, David Douglas was exploring the Columbia River in the Northwest of America, discovering the fir that bears his name. Thus Europe drew in plants from all the main continental edges on the same latitude. So Chapter 5 opens with the first gaijin ascent of Mt. Fuji, by a party of Englishmen in 1860. Among them was John Gould Veitch, on the spur of the moment appointed "Botanist to her Britannic Majesty's Legation at Jeddo" [Tokyo]. He was a prodigious collector, whose most famous introduction to the West was the so-called "Boston ivy", though it is closer to the grape vine than to ivy. To at least this British reader it's much more familiar by the name Virginia creeper, even though my compatriot Dr. Hessayon says that Boston ivy is the "proper" name. Then, at last, in 1872, we come to the establishment of the Arnold Arboretum in Boston Massachusetts, and its first director Charles Sprague Sargent. He personally took part in the arboretum's first Asian mission, to Japan, where he met up with a couple of English collectors, the younger Veitch, and Charles Maries. This era was I suppose the beginning of the first wave of western infatuation with Japan. This visit resulted in many new plants for the arboretum, in particular the dazzling deciduous azaleas which are common on the hills around Sano. Despite earlier comments about the more hospitable reception in Japan, the next explorer, the French Abbé David, made very extensive forays into China, and gave us a whole genus - Davidia, or the handkerchief, ghost, or dove tree. There was extensive collaboration between American and European collectors in Asia; Ernest Henry Wilson was the British representative from the Veitch firm in London, who stopped in Boston to talk to Sargent at the Arnold Arboretum, on the way to his successful mission to bring home the dove tree from China. The final chapter covers the continuing work of the arboretum. Wilson was persuaded to leave his family in England for two more expeditions to China; they accompanied him for a spell of work in Boston, and also on a final Asian tour to the Japanese Empire, which at the time (1917) included both Taiwan and Korea. This chapter also includes an impressive selection of Wilson's photographs. There are more recent developments, too, including Metasequoia, or the dawn redwood, first discovered only in 1941, and the work still goes on with modern Asia-America collaborations. The illustrations alone would make this a wonderful book to browse through. The only problem I have with it is that the story just isn't simple. So many people, at so many times and in so many places, took the trouble to notice interesting plants, that one's head begins to spin with all the names. But that's the nature of things.